Terso Solutions began more than ten years ago inside our parent company, Promega Corporation. Bill Linton, Promega’s founder, saw the need for a complete inventory management solution for tracking high value products, and set out to design a solution that would completely automate these inventory management processes. In 2005, Terso Solutions was spun off as a wholly own subsidiary of Promega, offering commercially available RFID solutions for automating inventory management in healthcare and life science. 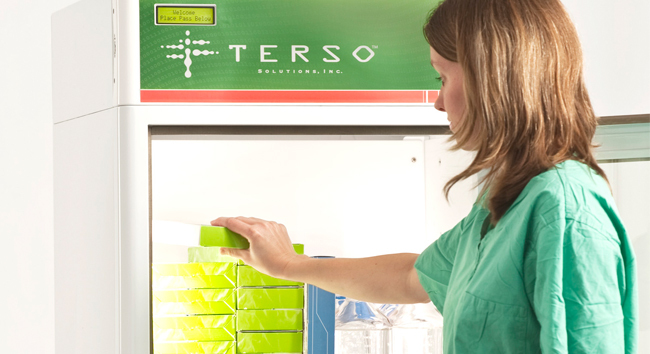 Terso’s inventory management solution consists of three parts: RFID enabled cabinets, refrigerators, and freezers; Hosted Inventory Management Software; and 24/7 Proactive Monitoring of all inventory in the field. Since 2005, we’ve placed more than 900 RFID-enabled cabinets, refrigerators, and freezers around the world. Our RFID solutions help eliminate manual processes, improve regulatory compliance, and reduce stock-outs and expired products. Our Healthcare customers use our solution in Clinical Labs, Emergency Rooms, and Hospital Supply Rooms every day. And our Life Science customers take advantage of an efficient, 24/7 solution for managing high-value scientific products in research laboratories and production facilities. Our history and financial strength are key to our ability to attract the best and brightest minds in the RFID industry. This has allowed us to create a culture that supports technical excellence with a focus on innovation. Working with Terso Solutions allows you to leverage our expertise as an extension of your team. Since our formation in 2005, we’ve grown significantly. And we did it by focusing on one customer at time, while balancing our solutions across emerging technologies.